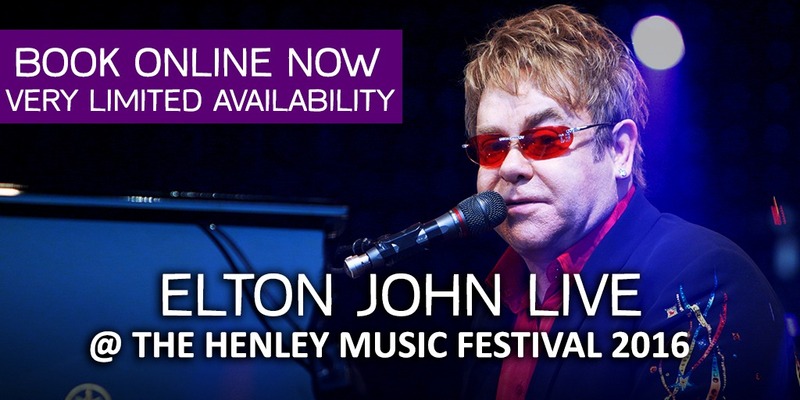 Elton John has been revealed as the headline act for the opening day of the 2016 Henley Festival. Eventmasters are delighted to announce that we are the exclusive official hospitality agent for the outstanding Henley Festival. Henley Festival hospitality packages are available for all five days of this glorious event; Wednesday 6th – Sunday 10th July. Eventmasters are also delighted to announce that our website is currently the only place where you can book your Henley Festival hospitality packages online. This unique event offers something for everyone and brings together music and the arts in a picturesque setting. With music ranging from classical and jazz to pop hits, we are sure there will be something to fit your tastes. Elton John is one of the world’s biggest musicians and has sold over 250 million records worldwide, including 37 gold and 27 platinum albums, along holding the record for the biggest selling single of all time. You can see Elton John perform all of his classic hits on the fabulous floating stage with our exclusive Henley Festival hospitality packages. The Riverside Restaurant provides you with the perfect environment to soak up the atmosphere of the Henley Festival as well as giving you a luxurious space to entertain your important clients and guests. Our exclusive VIP Henley Festival hospitality packages include; champagne reception, three-course dinner with selected wines & coffee, complimentary bar and Grandstand A, Grandstand B or VIP Lawn A tickets and much more. You are guaranteed a fantastic day of music and hospitality at the glamorous Henley Festival. Don’t miss out on the chance to see one of the world’s biggest artists in VIP style. You will not be disappointed with our excellent range of Henley Festival hospitality packages. For more in depth information on our Henley Festival hospitality packages please follow the links.